Create powerful, fast, customized 3D images and 3D models with a fusion of your geologic data, GIS data, well and borehole data, and point cloud data with Voxler. Easily import and combine data in a multitude of file formats to create stunning 3D models that visualize the relationships across your data set. This robust, yet user-friendly application gives you the power to display your data in full 3D. Explore the world of 3D well and volumetric data visualization with Voxler! Voxler is the industry leader in 3D well modeling, 3D geological data visualization, 3D surface mapping, and 3D point cloud visualization and interpolation. Voxler imports your raw, complex 2D and 3D data and seamlessly models it into a rich, interactive, user-friendly 3D visual environment that produces easy to interpret results and aides in decision making for scientists and major stakeholders alike. The updated, easy-to-understand user interface allows you to quickly combine, visualize, and examine the depths of your data in true 3D space. With robust data compatibility, importing data into Voxler is fast and easy. 3D point cloud visualization has never been more seamless; you can filter anomalies, duplicates, or areas you want eliminated and then interpolate the data. Interactively manipulate your data real-time while viewing the results, and generate publication-quality output. 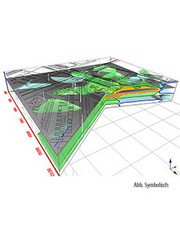 Geoscientists, environmental scientists, project stakeholders, GIS analysts, independent consultants, and educators who are interested in visualizing any type of 3D data and more.